This is the 3rd year that Nicole and I have done this and if you didn’t know, National S’mores Day is Wednesday (August 10) so get your booty to the grocery store for all the supplies you need. And if actual s’mores bore you, Nicole and I have 10 fun s’mores treats planned for the week! 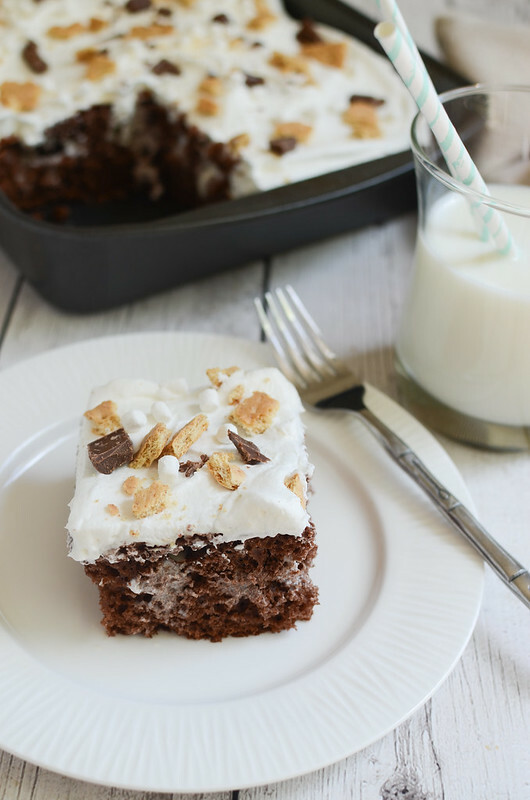 I’m kicking the week off with a S’mores Poke Cake! 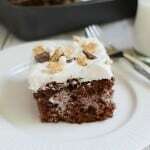 Do you love poke cake? I love a poke cake. They are definitely among my favorite cakes. This one is a chocolate cake (from a box! Or use your favorite recipe!) and then you poke holes all over it and pour marshmallow sauce on top so that it seeps into all the holes. Then Cool Whip on top, of course. 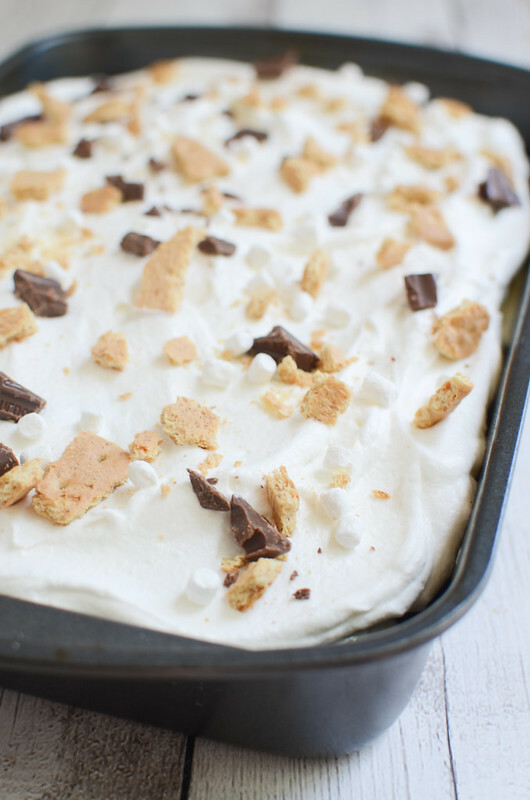 And then top it off with some roughly chopped graham crackers, Hershey’s bars, and marshmallows! You have to go to the ice cream topping aisle to find this marshmallow sauce. Don’t try to use marshmallow fluff – that’ll be way too thick and won’t fill in all the holes. Use this sauce and it just soaks into the cake and creates the moistest, most delicious cake ever. Also, the teeny tiny marshmallows I used on the top are over by the hot chocolate. I know, I’m sending you all over the grocery store. They have the texture of Lucky Charms marshmallows so it’s worth the hike. I’m not gonna tell you how many slices of this I had last week but know that I was having a man-related crisis and nothing fixes that quite like chocolate cake soaked in marshmallow sauce. Now go check out Nicole’s S’mores Cheese Ball! 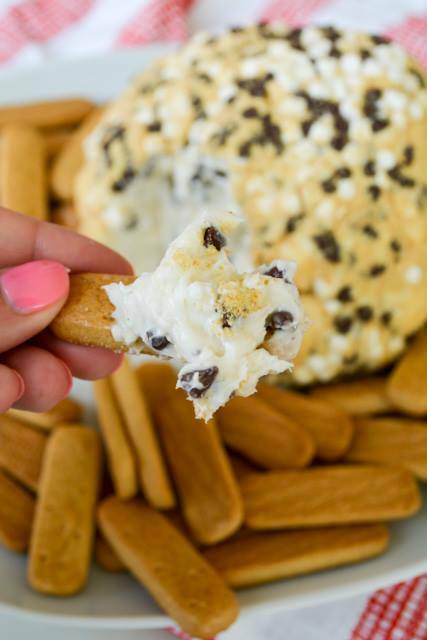 Because the only thing I love more than a poke cake is a dessert dip! Prepare cake mix and bake according to package instructions. Let cool for about 10 minutes. Use the handle of a wooden spoon to poke holes all over the cake. 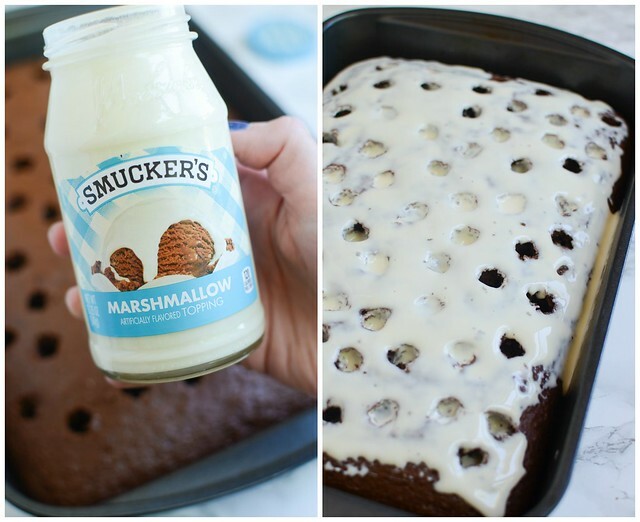 Pour the marshmallow sauce on top and use a spoon to make sure the cake is covered. Cool completely. Spread the Cool Whip over the cooled cake. 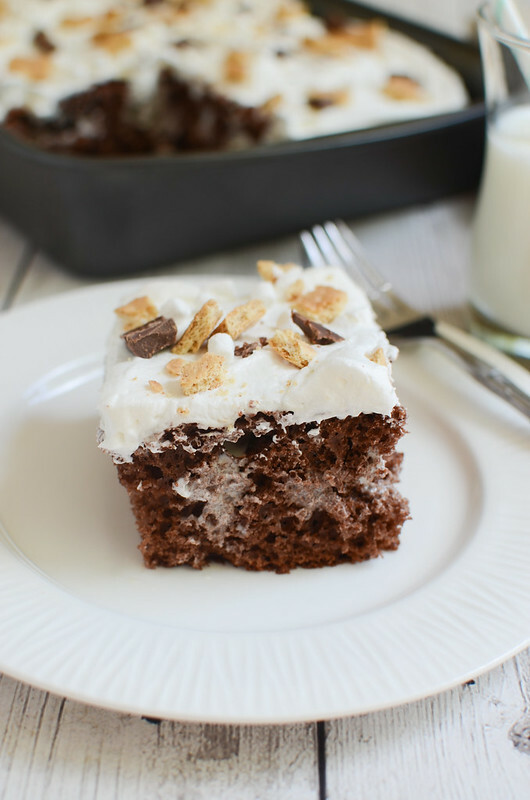 Sprinkle marshmallow bits, chopped Hershey's bar, and chopped graham crackers on top.